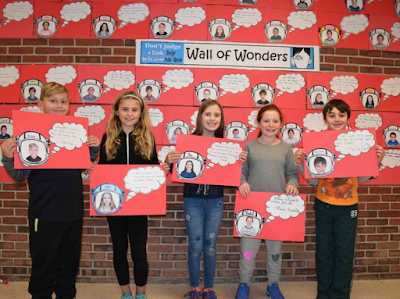 The fourth graders at the Nassakeag Elementary School created a wall of "Wonder" featuring their guidance on how to #ChooseKind. The teachers and students took the opportunity to write their own precepts to make a powerful display at their school after reading the book thanks to excellent curriculum development by their teacher, Miss Donato. It is so heartening to see the impact that the book has on children. One school classroom at a time, the book positively impacts the hope for kindness in the present and future. Thank you Nassakeag Elementary. Keep up the great work. To read more about this story, go to the Three Village Patch.